Stand the chance to WIN a DJI Mavic Air Drone + an Aeroview Seasonal Package for 100 Hectares worth R65,000 for Christmas! 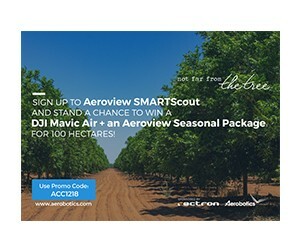 Sign up to Aeroview and you could WIN a DJI Mavic Air Drone + an Aeroview Seasonal Package for 100 Hectares, worth R65,000from our #NotFarFromTheTree Christmas Competition! Map out your farm and make the most of Aeroview's in-field tracking and reporting for pests and diseases. Spread the news! Tag a farming family in the comment section of this post and help better their chances of winning. The competition starts on the 3rd of December 2018 and ends on the 17th of December 2018. The winner will be announced on the 19th of December 2018 on our Facebook page. T&C's Apply. Find out more about #NotFarFromTheTree here.